The Association was formed in 1879 but there are reports of its existence even 60 years before that. The list of Presidents is however complete from 1879. Jimmy Burns (born Madrid, 1953) studied at Stonyhurst from 1966-1971, after attending St Philip’s School in London. He then studied Modern Iberian & Latin American Studies at University College, London (BA) and Politics & Government at the London School of Economics & Political Science (MA). After working for The Catholic Herald, and as script writer and researcher with BBC and Yorkshire TV, he joined the Financial Times, where he pursued his career as a foreign correspondent and with a range of other reporting jobs including security, public policy, and politics. Since retiring from the staff of the FT in 2009, he has continued his links with the newspaper and continues to contribute to media on both sides of the Atlantic. 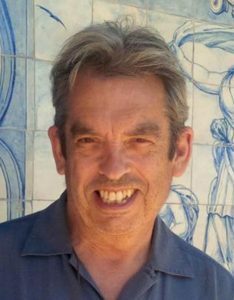 He is the author of several books including the Land that Lost its Heroes which won the Somerset Maugham prize for non-fiction, Papa Spy, and a biography of Pope Francis. He is the author of Cristiano & Lionel: The Race to be the Greatest Footballer in History published in May 2018. 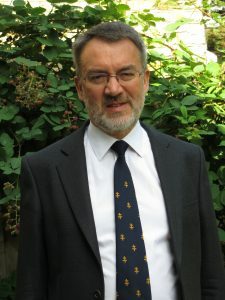 He has served as a non-executive director of The Tablet, chairman of the charity The British Spanish Society, and a volunteer with The Lourdes Pilgrimage. Robert Brinkley is a senator (member of the governing body) of the Ukrainian Catholic University (UCU) and chairman of the Ukrainian Institute London, which is affiliated to UCU. He also chairs the Chatham House Ukraine Forum and the BEARR Trust, a British charity which supports small health and social welfare groups in Eastern Europe, Russia, Central Asia and the South Caucasus. He is a trustee of the Keston Institute, which studies religion in Communist and former Communist countries. He offers consultancy advice to businesses and comments in the media based on his international experience. Until 2011 Robert Brinkley was a British diplomat for 34 years. He served as High Commissioner to Pakistan (2006 – 2009), Ambassador to Ukraine (2002 – 2006) and as head of the UK’s worldwide visa operation (2000 – 2002). He had previously had two postings in Moscow (both in Russia and in the Soviet Union), as well as positions in Bonn, Geneva and the Foreign and Commonwealth Office in London. In 2010 – 2011 he was seconded to Associated British Foods plc. He speaks Ukrainian, Russian and German. Past President Father Nicholas King SJ, OS 1966. “After Stonyhurst I went up to Oxford to read Classics, with the firm intention of becoming a wealthy barrister after that. However at a particular moment, which I can date to within a few minutes, and greatly to my surprise, I realised that the only thing that I could do if I was to be happy was to join the Jesuits, who had taught me at Stonyhurst. That was 47 years ago, and (so far) I have seen no reason to change my mind… For twelve years I taught New Testament and Greek at the University of Oxford, where at Campion Hall, the Jesuit house. Most recently I have published a translation of the entire Greek Bible into English, something that I can hardly believe. Currently I am Lecturer in Biblical Studies at Heythrop College in the University of London. Before I came back to Oxford, I taught for many years in South Africa, which was one of the most remarkable experiences of my life. Jesuits do all sorts of things, and our task is to do whatever the Church asks of us. Like many of my confreres, this particular Jesuit has always been a teacher at secondary or tertiary level; but I have also done a good deal of writing. And I have coached cricket and Rugby in my time. Let me simply say this: if it is the life for you, then there is no better or happier way of life. But it must be the life to which God is calling you”. 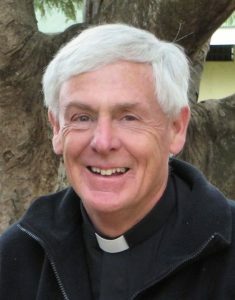 Fr Nick was a tutor in New Testament Studies at Campion Hall and the Theology Faculty at the University of Oxford. He is a celebrated translator of the New Testament. He is currently living in London and working as the Provincial’s assistant for formation. 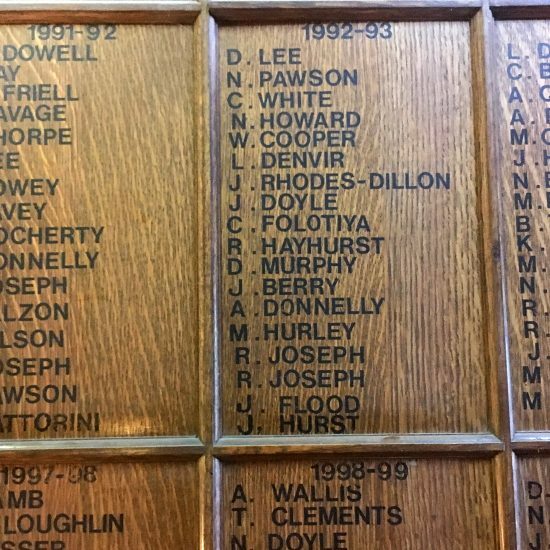 Please click here for a complete list of Stonyhurst Association Presidents since 1879.